Want to keep up with the latest Ford XR6 Turbos, Holden LS1s and Subaru WRXs but you can’t afford the $40+ grand price of admission? 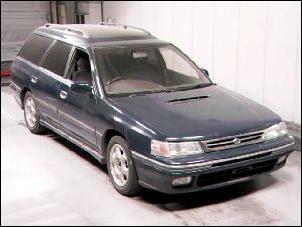 Well, the early ‘90s Subaru Liberty should be right near the top of your shopping list. In standard form, the mighty RS delivers performance in the ballpark of today’s hot performers and is easily built into a rocket ship. 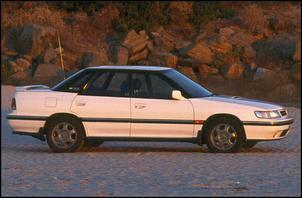 The Liberty RS sedan (chassis code BF5) was introduced in Australia during 1991 and a wagon version appeared in 1992. 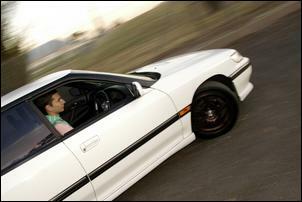 Sales continued until 1994 when the smaller Impreza WRX took over the reign. Liberty RSs all use Subaru’s constant AWD system that employs a viscous centre coupling to apportion torque between the front and rear wheels depending on slippage. An LSD is fitted to the rear axle while the front axle uses an open-centre differential. Brakes are ventilated discs at each corner with ABS fitted to some examples. But the most important bit can be found under the bonnet. 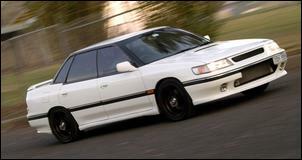 The Liberty RS was the first Subaru to use the EJ20 2.0 litre flat-four turbo engine that continues service (in updated form) in today’s WRXs and STis. The EJ20 turbo boasts quad camshafts, 16 valves, full engine management, a single IHI VF12 turbocharger and water-to-air intercooler. With a static compression ratio of 8.0:1 and boost pressure set to around 11 psi, the Australian-spec Liberty RS generates 147kW at 6000 rpm and 260Nm at 3600 rpm. The Australian-spec RS was released with a 5-speed manual only and it seems that road testers had difficulties extracting consistent performance times due to the car’s finicky launch technique. The best quarter mile passes snuck in below 15.0 seconds while other attempts were slightly over. Either way, that’s not bad performance from a 1355kg vehicle with a 2.0 litre engine! The constant AWD driveline also gives the Liberty immense grip and handling stability. Despite the performance on tap, Subaru was careful not to give the Liberty RS a ‘boy racer’ appeal. Instead, it was given conservative 15 inch alloy wheels, a low rear spoiler, side skirts, sports front bumper (with fog lights) and a small bonnet scoop. Colours were limited to white, charcoal and burgundy. 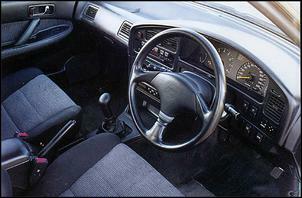 Inside, the Liberty RS received sports trim, a Momo leather wheel and gear knob, 260 km/h speedo and 7000 rpm redlined tacho. This was in addition to Liberty GX-spec features such as power windows, electric mirrors and central locking. In a modern context, all that’s missing are airbags, a retractable centre rear seatbelt and front seatbelt pre-tensioners. An electric sunroof and CD player were optional. There are a few problems to look out for when buying a Liberty RS. Interestingly, the Liberty RS had widespread lifter noise problems and many examples were fixed under warranty. The ‘fix’ was very time consuming and expensive for Subaru – the process involved switching to WRX heads, pistons and associated components. 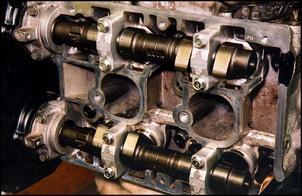 Those cars that were not treated to a WRX head swap are likely to experience worsening lifter noise issues. Another common problem is failure of the direct-fire ignition coils. These are frequently replaced with new parts but, in some instances, people convert to an entirely different coil and lead set-up. 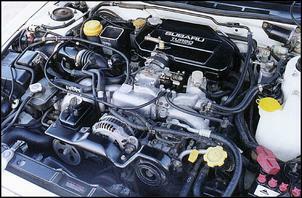 The electric water pump for the water-to-air intercooler system is also known to fail due to age. A bearing noise is the first sign of deterioration and is usually followed by seizure. A new pump is quite expensive from Subaru but we have heard of owners rebuilding the pump using new bearings. Overall, the Liberty RS is an extremely reliable vehicle with the potential to drive 300,000 kilometres without a major engine or turbo overhaul. 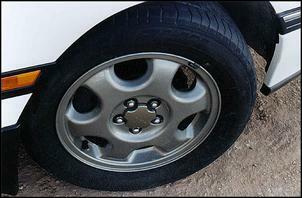 Regular oil changes are critical and, as always, you should ask the seller to provide detailed service documentation. And what price should you pay? Well, the Liberty RS has held its price very well in recent years. The average price for a Liberty RS is currently between AUD$11,500 and AUD$15,000. We suggest that you avoid paying top-dollar because the lighter, faster and newer WRX (from 1994 – 1996) is now dipping to around the 15 grand mark. Certainly, the Liberty RS is a great car with heaps of potential but keep in mind that it’s now more than 10 years old and a contemporary Mitsubishi Galant VR4 and Toyota Celica (both AWD turbos) typically sell for a few grand less. 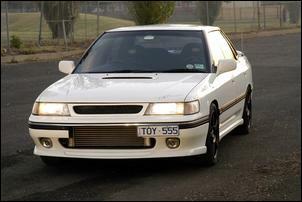 There are many ‘grey market’ Japanese Legacy RS turbos currently in Australia . The Japanese-spec version was released in 1989 and these early models are identified by their different nose and taillight/number plate treatment. The Japanese Legacy RS is essentially the same as local examples except for their 180 km/h speedo, speed limiter and different trim specification (which often includes climate control). Mechanically, the Legacy RS has a more aggressive ECU tune (although power output appears identical to local models) and was sold with an optional 4-speed auto and two-mode power steering. There are no parts availability problems for Japanese import Legacies but some insurance companies may charge a higher premium compared to an Australian-spec version. 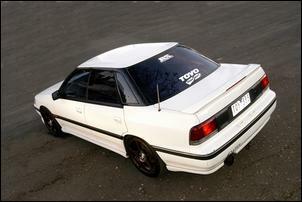 Fortunately, Japanese-import Legacies generally sell for a couple of grand less than their Australian-spec counterparts. Joe X of Melbourne owns this Australian-spec Liberty RS which is a good example of what can be done without going over the top. Joe bought this example with about 250,000km on the odometer and completely standard aside from a set of Koni dampers. Once in Joe’s hands, the car was treated to a full-length 3 inch mandrel exhaust with a high-flow cat, centre resonator and A’PEXi rear canon. The factory air intake was also pulled out and replaced with a HKS pod filter and new piping that provides a straight passage to the turbo inlet. 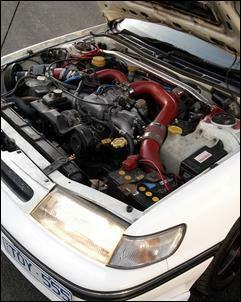 A custom front-mount air-to-air intercooler, adjustable atmospheric venting blow-off valve and 16 psi boost helped give the EJ20 plenty more spice. But when Joe learned that one cylinder had slightly low compression he leapt at the chance to buy a low kilometre (50,000km) engine rebuilt by AVO. The engine had been equipped with ported and polished ’96 WRX heads, ’96 WRX pistons, ’97 WRX camshafts, heavy-duty valve springs and 2mm stainless head gaskets. The rebuilt engine was slotted in with the existing exhaust, air intake and intercooler set-up and the standard VF12 turbo was kept. With boost pressure set to 17 psi, Joe says the car should make about 145 – 150kW at all four wheels on a Dyno Dynamics chassis dyno. This is approximately 50 percent more power than standard – a very healthy gain! The engine management currently remains stock except the fuel and ignition systems have been tweaked. A Walbro fuel pump and Bosch HEC716 coils (with individual plug leads) replace the problematic stockers. Another relatively easy fix was the replacement of a broken radiator header tank using the tank from a later-model WRX (which required modified mounts to fit). And what of the RS’s delicate driveline? Well, Joe has chewed through 4 clutches in 2 years and is currently using an Xtreme dual-friction clutch. We’re told this is a great clutch for the street – smooth, light and grippy. An APS lightened flywheel is also part of the combo. 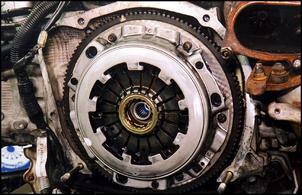 The standard gearbox died when a collection of teeth was stripped from the input shaft and driven 1st gear. Following this, Joe upgraded to a STi Version 3 RA gearset which was fitted inside the standard Liberty RS gearbox case. The RA gearset has proven reliable and provides altered gearing – 1st gear is taller than standard while 2nd to 5th are shorter. The existing Koni dampers have been teamed with lowered King springs, a Whiteline adjustable rear swaybar (set at its firmest position), anti-lift kit and front strut brace. Joe says these mods give the car fantastic balance. Brakes are stock aside from Bendix Ultimate pads. Visually, Joe’s RS is set apart thanks to its lowered ride height, colour-coded side skirts, modified front bar and front lip (sourced through www.rslibertyclub.org). The wheel arches are also filled by Speedy 17 inch alloys wearing Toyo T1-R performance street tyres. Inside, the sound system has been upgraded to include a JVC DVD head unit, 3 channel amp, Focal front splits, Alpine rears and a single sub. An aftermarket steering wheel, gear knob, SAAS reclining seats and a suede roof lining complete indoor renovations. Even with 290,000km on the body and around 80,000km on the replacement engine, this mighty RS shows no sign of slowing!